Marvel Studios head Kevin Feige may get the headlines, but few people have as much tactile influence on the Marvel Cinematic Universe as its design department—in particular, head of visual development Ryan Meinerding and visual design supervisor Andy Park. Their teams split up design duties on Marvel’s schedule and are often hard at work on a movie long before there’s even a director or script. And their work can also continue right up to the release of the movie. Nevertheless, Park was excited by the prospect of doing something new and unexpected. First up, he and Waititi got to work on Hela, the goddess of Death, who was to be the film’s main villain. 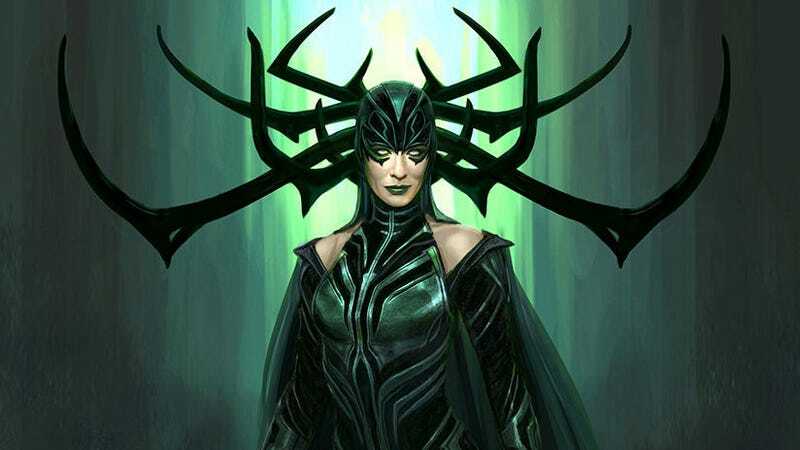 Park vaguely recalls doing some very early Hela designs before Waititi came on board, and in the director’s commentary on the Ragnarok Blu-ray, Waititi gives Park and his team full credit for the design of the character. Still, Park says it was more collaborative than that. The other big thing that Waititi impressed on Park and Marvel was a desire to do more than just pay homage to the bright, influential artwork of Marvel Comics legend Jack Kirby—he wanted to “drown” in it. It was so all-encompassing that, at times, Park said he felt way out of his comfort zone. Thor’s gladiator outfit, seen here, was a point of contention on the film. One such example had to do with Thor’s gladiator outfit. Waititi’s vision of what Thor would be wearing when he fought the Hulk was unlike anything Park had ever designed for Marvel. A typical movie design department might work on one film than jump onto the next. At Marvel Studios, though, there are days when Park may touch five different movies on the same day; even though his team does the bulk of their work six to eight months right after a film is greenlit, he has to work at various other stages, too. He works with the costume designers. He goes to fittings with actors. And on Thor: Ragnarok, he even continued working on the film’s design after it was done shooting. The final version of Hela. Finally, even after a film is done, the work continues, with the design department working on the Art of book and posters. But even then, they dive right into the next thing. For Park, that’s Captain Marvel, out in 2019—followed by many more movies that he can’t tell us about. After all, Marvel did just announce release dates for six untitled films coming in 2021 and 2022. At least Park, Meinerding, and their teams of Marvel designers know they have plenty of job security.